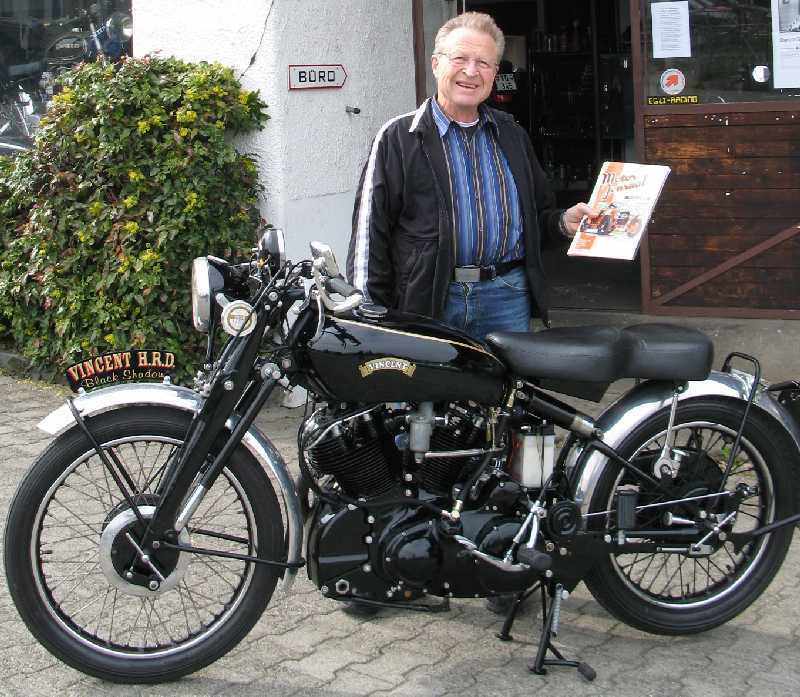 After 46 years dedicated to performance motorcycles, Fritz Egli has decided to “hang up the gloves” and retire at the age of 77. This information has been communicated by Motorrad, a German Motorcycles magazine (1) which mentions that Fritz Egli, owner of Egli AG is looking for investors to take over the business that he runs in partnership with Jürg Lindemann, his Workshop & Technical Director. 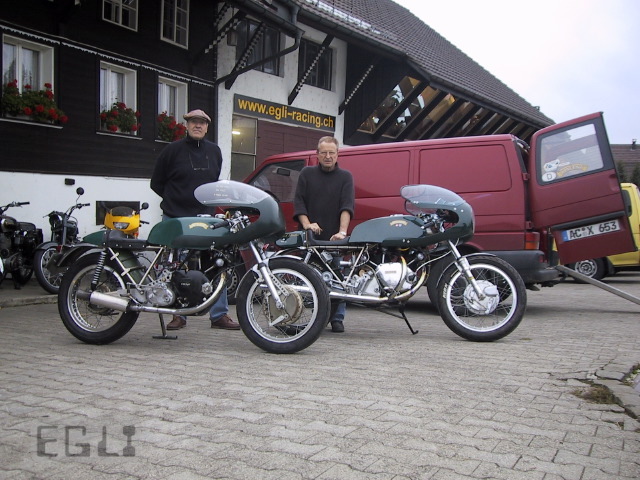 Egli AG employs 12 people and is nowadays more focused on the distribution of the Norton and Royal Enfield motorcycles in Switwerland than the manufacturing of exclusive Café Racers as it used to be in the 70s up to the mid-90s. However the team has still has extensive capabilities to prepare or build bikes for Racing and street legal use. The adventure has started in the 1967 Swiss hill climb championship. 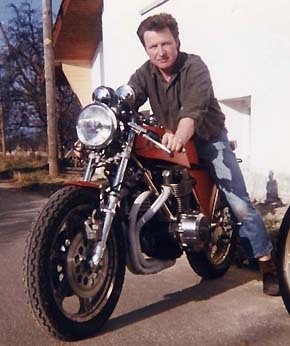 Fritz was at that time racing a slightly modified Vincent Black Shadow and was frustrated by his results. He already knew that if he wanted to win, he had to build his own frame. Fritz in the paddock in 1967; as you can see the Black Shadow is fairly stock but the front Girdraulic has already been swapped by a telescopic with a conical brake. The first Egli will be design and built during the next winter. 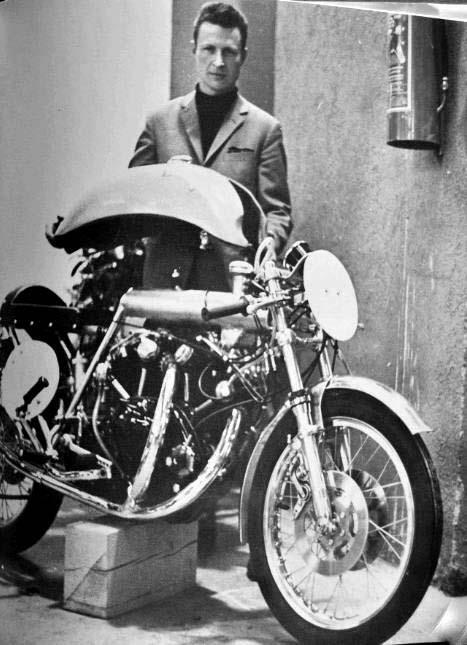 Here we are, one year later at the end of 1968, Fritz was the Hill Climb Swiss Champion with his own bike, the Egli-Vincent; as Egli was starting his business, the legend swastarted to Rock & Roll! Four years later, the market had changed completely for his business. 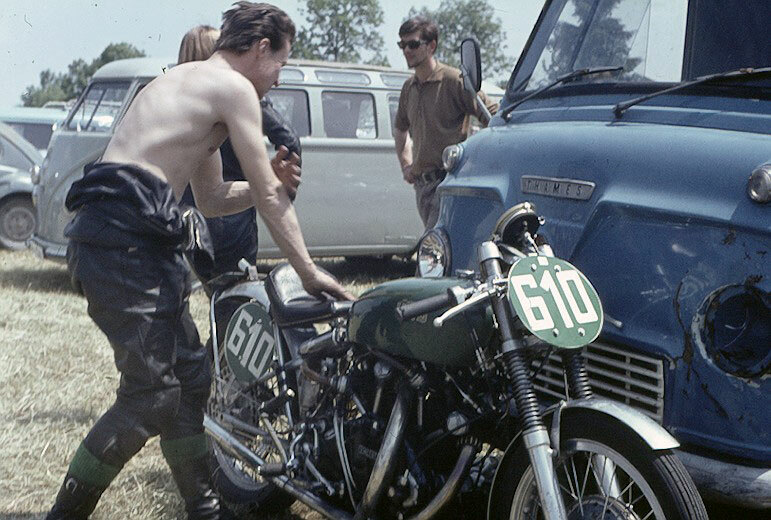 The main hurdle to build the Egli-Vincent was simply to find Vincent donor bikes, and Slater, who was Egli licensee across the channel, was much better positioned to develop the Egli-Vincent business. Indeed, at the begining of the 70s, there was a quite important number of disregarded Vincent in sheds or as basket cases in the UK. This made all the difference and Fritz decided to shift focus and concentrate on the growing demand for the Honda CB750 Four. Fritz is an engineer and thus deeply involved in all the innovations that his team developed, from the rolling frames to the engine preparation. 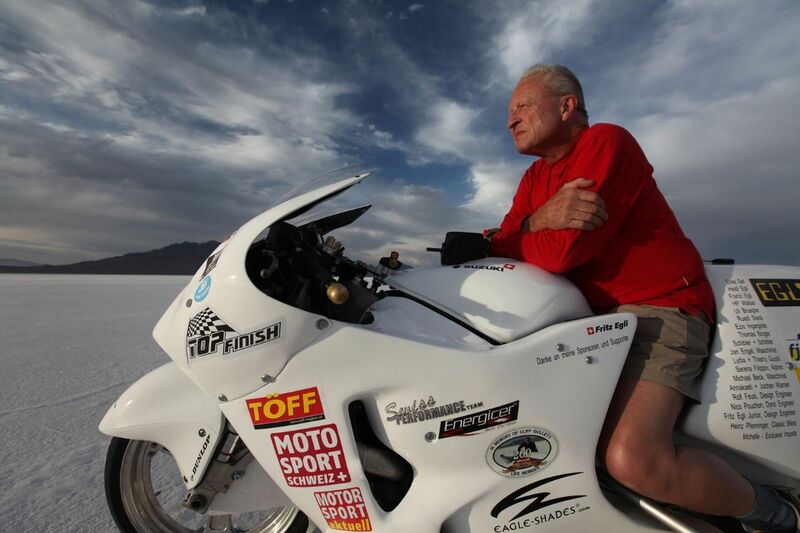 In 2009, Fritz and his team went to Salt Lake City for his ultimate race: blow the 200mph wall with his specially prepared Suzuki Hayabusa that delivers 400HP. He achieved 203mph (327kph) in the first run and 208.723mph (336kph) in the second, beating the previous record by more than 30mph. 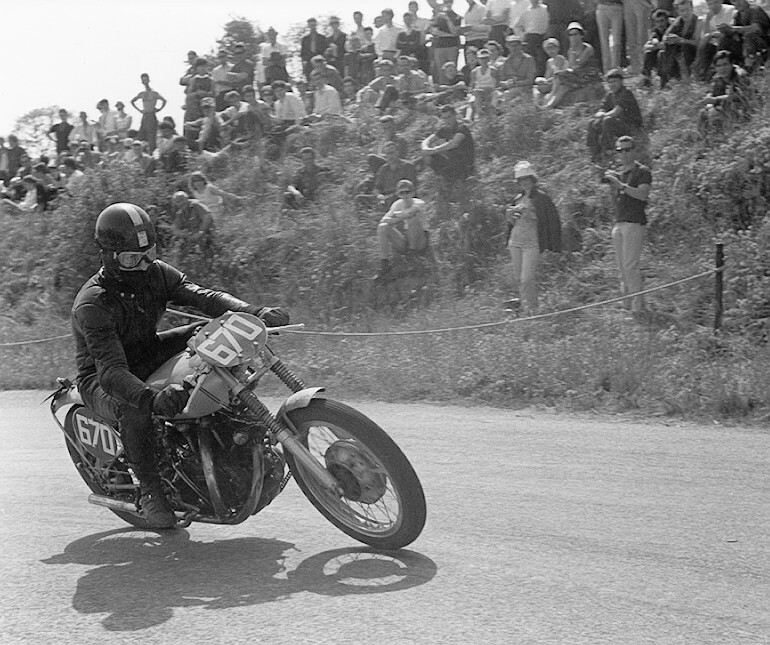 Back to the beginning when everything started; Fritz was indeed given an already “old” Black Shadow that he decided to race in the Swiss Hill Climb Championship; this was going to change his life and about 45 years later, his name and his contribution to the Racing and the development of the modern motorcycles are recognized and respected by all his peers. You did earn the right to retire, Sir! Hi – I just purchased a 1982 Honda CB1100R (SC08) in a original patina condition. Peter Egli, Romanshorn – CH. Born 1961. 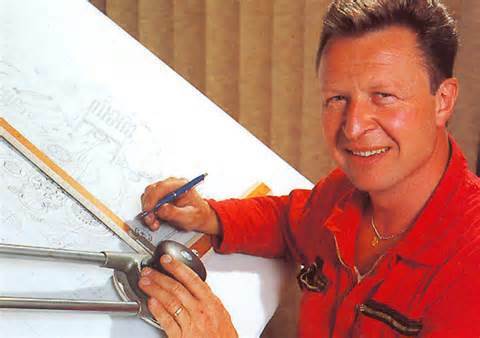 Any connection to the well known Fritz Egli ? ?